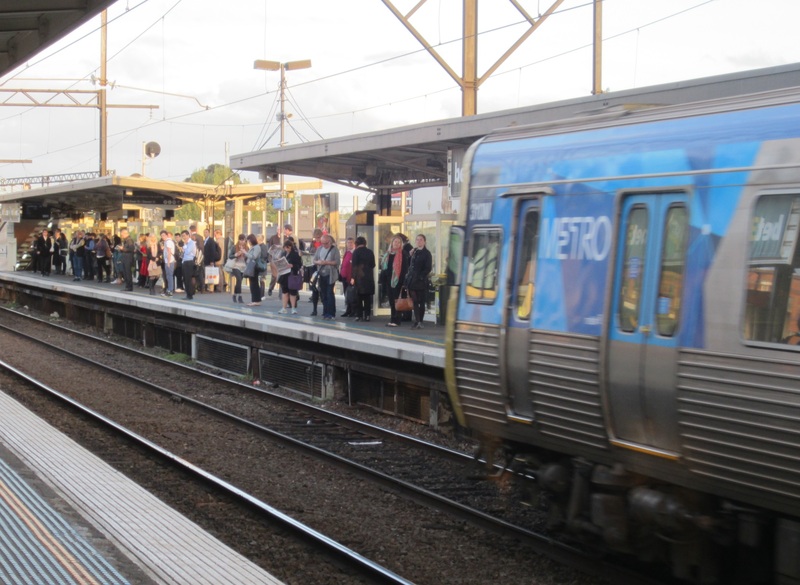 Fewer than 1 in 17 Melburnians travels between the eastern and western suburbs to go to work. But 45% work close to home and another 20% in the inner city, according to PTUA analysis of journey to work data from the 2011 Census. It has been known since at least the 1990s, largely based on work by the late Paul Mees, that around half of all travel in Melbourne is over short distances, and a majority of the rest is to or towards the CBD. The latest data confirms all the earlier findings about how important local and radial travel are in Melbourne, and how little there is of the kind of long distance cross city travel that the Napthine Government says we need an East West Link for. 45 % of Melburnians work close to home, crossing at most one or two suburbs to go to work. A further 20% work in the CBD or in adjoining areas like Carlton, Richmond or South Yarra. Where travel to work is over a long distance, well over half is aligned with Melbourne’s radial rail corridors. Less than a quarter (24%) of journeys to work cut across multiple rail corridors. In particular, less than 6% are from the eastern to the western suburbs or vice versa – the kind of travel that the $18 billion East West Link is supposed to cater for. The study considered journeys to work, because there is loads of reliable, recent data about this kind of travel, and because going to work is still by far the biggest reason people travel long distances within cities. Congestion is at its worst in peak hour, and getting to and from work is the primary cause. The findings are particularly relevant when one considers journeys to work that use the Eastern Freeway or Alexandra Parade. For every one traveller going east-west, there are nearly 4 going to the city centre. But these are all vastly outnumbered by people on short hops of just a kilometre or two, for whom an East West Link is irrelevant but who still make up most of that arterial road congestion. Trucks and vans are part of the mix too, but congestion is a car problem, not a truck and van problem. Freight makes up less than 10% of travel on the Eastern Freeway, and 13% on the West Gate Bridge . Most of this moves in off-peak periods. Our study also looked at different regions of Melbourne to identify where the various kinds of travel are more or less prevalent. The pattern is nothing like that claimed by motorway proponents like the Linking Melbourne Authority. South and east of the Yarra, for example, eastwest cross-city travel is only 4% of journeys to work, and it shrinks even more the further one goes from the city. In Knox, it’s less than 2 per cent! Where does the most east-west travel occur? A lot of it occurs between origins and destinations north of Bell Street, where it’s about 12% of trips. A lot more of this kind of travel occurs now because of the Ring Road. But people will not drive from Reservoir all the way down to Collingwood just so they can use the East West Link to go to Broadmeadows. The other major source of eastwest travel is people who live in Melbourne’s west or south-west and work in the eastern suburbs. For example, someone may live in Caroline Springs or Point Cook and work in Hawthorn. They would actually be well served by a train into the city and a quick change at Flinders Street – if only we fixed up the trains and feeder buses in the western suburbs. But this is clearly not a government priority: Premier Napthine would rather use the available money to condemn them to sit in traffic for the rest of their life instead. The study results sit well with the earlier findings of the 2003 Northern Central City Corridor Study, that only 15% of Eastern Freeway traffic is headed due west. It is also consistent with Vicroads data showing a slight decline between 2002 and 2012 in traffic on major east-west arterial roads such as Victoria Parade, Alexandra Parade and Bell Street. The latter reveals a definite trend toward less car travel in the inner suburbs as people express a preference for public transport. Similarly, our study shows that travel patterns in Melbourne are actually very well suited to the infrastructure we have. Our main problem is with dilapidated rail infrastructure and inadequate suburban bus services. A single Richmond train meltdown last April, for example, was equivalent to shutting down the West Gate and Bolte bridges simultaneously for a day without warning. Critical rail infrastructure is simply not that vulnerable in a well-managed city. The focus of transport provision needs to be on fixing the trains – just like the Coalition promised to do in 2010 – and building “infrastructure of the 21st century” such as the Doncaster line and eventually the Metro tunnel (in its original Eddington incarnation). In terms of passenger capacity, the latter provides a West Gate Bridge alternative three times over. Public transport could then take its rightful place as the backbone of our city. Josh Gordon, “Trucks test structure of West Gate“. The Age, 18 March 2013. EWLink – Campaign action day – Tuesday 16th!